Each week here on numberFire, we’re going to dig into the track that’s hosting the upcoming weekend’s race to see what all we need to know when we’re setting our lineups. We’ll have a separate piece that looks at drivers who have excelled there in the past; here, we just want to know about the track itself. Once qualifying has been completed, we’ll also have a primer detailing which drivers fit this strategy and should be in your lineup for that week. This week, the Monster Energy NASCAR Cup Series will kick off the 2019 season with its biggest race: the Daytona 500. What do we need to know before filling out lineups this weekend? Let’s check it out. The big story of the 2019 NASCAR season is going to be the new aero package. It’s going to radically alter the way races play out at certain tracks as cars won’t be as strung out throughout the race. At Daytona, that’s not an issue. They’re already racing in a giant hornet’s nest of cars, and the same package as 2018 will be in place this weekend. With it comes a highly unique strategy for daily fantasy. In general in NASCAR DFS, if you want to generate upside on FanDuel, there are really two ways to do so. First, you can pick a driver who leads a bunch of laps as you get 0.1 points per lap led. The other route is picking drivers who will finish better than they start as each spot is worth 0.5 points in place differential. In Daytona, that’s essentially trimmed to one. You need place-differential points, and you need a lot of them. There are a couple of factors that largely take the bonus tied to laps led out of play. The first is that there aren’t a ton of laps to begin with as the race is just 200 laps, leaving 20 total points available for laps led. The other is that the nature of the racing at Daytona prevents one driver from monopolizing the laps that are available. Over the past six Daytona races (including the Spring and Summer races) — since the field was trimmed to 40 drivers — only three drivers have led more than 51 laps in a single race. That does include three races in which there were just 160 laps as the July race is shorter, but it’s hard to dominate here. 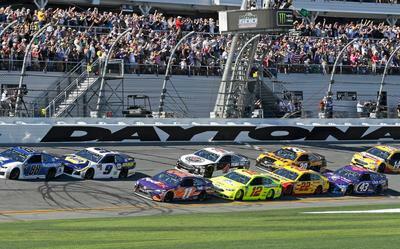 Of those three drivers who did manage to lead more than 51 laps, two happened in the Daytona 500 (Ryan Blaney in 2018 and Denny Hamlin in 2016). Both drivers led at least 95 laps, and those 9.5 points will go a long way in helping you separate from the pack. The problem is that leading a bunch of laps doesn’t always translate into a great finish. Blaney finished seventh last year, meaning two other drivers were able to out-score him in that race. Not shockingly, both started deeper in the pack. There have been eight drivers who have led at least 30 laps in Daytona over the past six races; of those eight, only three managed to finish in the top 10. Even if you do get the boost from the laps-led bonus, you’re not guaranteed to score well, which is another reason to de-emphasize that metric in favor of shooting for drivers capable of getting place-differential points. This is why we likely shouldn’t overreact to what happened this past weekend in the Advance Auto Parts Clash. There, Paul Menard led 51 of 55 laps, essentially dragging the field behind him for the entire race. If Menard had gone on to win, you probably would have needed him in order to score well. But he also fell victim to the finishing conundrum. In the 500, this could happen again. Someone could jump out like Menard and rack up a bunch of laps led, which will provide a boost to their DFS output. As we’ll discuss in the next section, that’s why you can target some drivers who are starting closer to the front of the pack. But even if one of those drivers does hop out and get some laps led, it’s not a lock that they’ll also finish up front. Long story short — you do want to favor gunning for place-differential points even after what we saw on Sunday. The difficult balance is that you also need drivers who can finish well because finishing points are clearly significant. With that in mind, is there a specific starting range we should target? Let’s dig into that a bit more now. If we’re going to try to identify the best spots to find high-scoring drivers, it’s wisest to tackle it from two different angles. First, we want to find which starting ranges broadly score well. Second, we’ll want to see which starting ranges bring the biggest upside for when we fill out tournament rosters. We’ll start with the averages just to get an idea of whether there’s a hot spot we should target more liberally. Because the Daytona 500 is a bit of a unique beast in its qualifying process (Thursday’s Duel races are used to set most of the starting order), we’re going to toss out the July races just for this portion. Once we do that, here’s the average FanDuel output of each starting range over the past three 500s. We’re dealing with small samples here, which is naturally going to create some fluctuation in each range. But the numbers for drivers starting 21st on back (41.87 points on average) are a noticeable amount higher than those for drivers starting in the front half of the field (35.80). The number for drivers starting in the final five spots is higher than for any other starting range, and it’s not particularly close. A big part of this is that those drivers have lower potential for super negative scores due to place differential. If a driver who starts 5th finishes 40th, they get -17.5 place-differential points; it’s just -2 if that driver starts 36th. The translation of this from a DFS perspective is that the further back a driver starts, the higher their floor will be. As such, if you’re playing a cash game, you want to stack the back and target drivers who performed poorly in their Duel race. They’ll have much loftier floors than those who start at the front, and they’ll still have at least some ability to churn out a good finish. Once we transition to discussing upside, though, the rules about stacking the back become a bit less strict. They’re still in place, but we can start to feel more freedom in targeting drivers starting closer to the front. One way to view this is by looking at the starting spot of the five highest-scoring drivers at past Daytona races. The salary cap matters a bit less at Daytona than other spots because the equipment gap isn’t as pronounced. So, if you were to assemble an “optimal” roster for the past six Daytona races, here’s what it would look like. The “spring” designation is the Daytona 500, and again, we should put a heavier emphasis on that data due to the qualifying rules. Because that data can all run together a bit, here’s how often each starting range popped up among the top five in scoring. In total, 19 of the 30 drivers to crack the top five in scoring for an individual race started 21st or lower. Even in tournaments, this is the area you’ll want to live most often. The biggest difference for the tournament rosters is that you’ll be able to sprinkle in the occasional driver starting closer to the front. You just have to be careful not to over-indulge. In our six-race sample, there were no races in which there were more than two drivers who started in the top 10 who wound up among the top five in scoring. There were two top-10 qualifiers in two races, one in three of them, and none this past July. If you use more than that, you’re really putting a lid on your roster’s upside. When you use a driver starting toward the front of the pack, you are requiring that they finish well in order to produce a good DFS day. Of 11 drivers who started in the top 10 and scored at least 55 FanDuel points, the worst finishing position was seventh, and that was when Blaney finished there after leading 118 laps. Three of the 11 won the race, and an additional four were either second or third. If the driver starts deeper in the pack, this is not a requirement. Aric Almirola had the fourth-highest score in last year’s Daytona 500 despite wrecking on the last lap and finishing 11th because he started all the way back in 37th. Using drivers in that range gives you wiggle room that you don’t have with those starting up front. This is yet another reason to go with those drivers in cash games. But how do we handle the drivers who qualify well in tournaments? If you’re rolling out multiple tournament rosters, you’ll want to vary the way you build your lineups. In one, you’ll want to fade the top 10 entirely. In the next, you could use one player starting near the front. Then — at most — you can plug two drivers from the front in and build from there. If the race winds up being more front-heavy than that, it’ll be an outlier, and you can likely still feel good about your process. If you’re rolling out a single entry for a tournament, you’ll want to build around an assumption. That assumption is that Driver X is going to win. Whether they’re starting 3rd, 13th, or 31st, you can then use that driver in the lineup. Then you find other drivers you think will finish well, limiting yourself to two of those drivers starting in the front. Sticking with these strategies should allow you to get drivers capable of winning the race on your roster without too severely hamstringing your upside. This will undoubtedly be a common strategy, but based on the data, it does seem to be the right one. The final thing worth noting when it comes to filling out multiple tournament rosters is that you’ll want your exposure to each driver to be lower than you’d normally put it at another track. Over the past 10 races at Daytona, every driver to compete has finished off the lead lap at least once, and Michael McDowell and Brendan Gaughan are the only drivers with at least four Daytona starts in that time who have finished a lap down less than twice. Things get random and wild here, and you will want to safeguard yourself against that more than you would elsewhere. Daytona is a high-variance track where almost anybody in the field can get a win, and anybody can wind up in the wall. As long as you acknowledge this variance and try to leverage it, you should be able to fill out some pretty tasty looking rosters.